5 star book review for Captive, Brighton Walsh’s latest contemporary, new adult romance novel, now available in bookstores. Enter a giveaway to win a paperback of Captive from St. Martin’s Griffin. The moment I read Captive’s summary, I knew this novel would be a favorite. Truth be told, I’m completely addicted to forbidden romance stories, and what’s more taboo than a woman falling for her kidnapper?! As anticipated, once I started reading, I couldn’t stop, work and other responsibilities be damned. I absolutely adore the fantasy of it all…from the non-traditional circumstances under which the heroine and hero meet, to the unlikely romance that emerges, and the very real obstacles that they face. With Captive, Brighton Walsh has created something engaging, heart-breaking, and incredibly hopeful. I give this 5 stars and definitely recommend it to fellow romance lovers. We begin with Madison Frost, waking up in the morning and wishing she was anywhere else. From the outside looking in, it seems that Maddie has a great life. Her father is a very prominent Chicago businessman, her mother is a popular socialite, she lives in a huge house with attendants, and she’s a successful college student at Northwestern University. But the fact of the matter is that Maddie is dying inside. Her father is a workaholic and never at home, which means she bears the full responsibility of managing her alcoholic, pill-popping mother. Every morning, the first thing Maddie does is check to make sure her mom is still breathing, fearful that this might be the day it ends. So if she’s so unhappy, why doesn’t Maddie just leave? Honestly, she’s trapped and unable to leave someone she loves behind, especially knowing no one else will be there. Alas, leaving would soon be a decision out of her control. That very same day, on her way home from school, Maddie is kidnapped. One moment she’s waiting for her driver to come pick her up and the next she awakens in a small cabin in the middle of nowhere with a man called Ghost, her kidnapper. Ghost is lethal…massive, tall, tattooed, muscled-up, stacked, and dangerous. But he readily promises that he won’t kill Maddie. Someone wants her out of the way for awhile and it’s Ghost’s job to make that happen. So if they just sit tight and wait it out, Maddie will make it out of all this alive and be able to get back to her life. However, as we see through alternating POVs, things between Maddie and Ghost quickly turn. There’s a physical attraction between them that only deepens as they get to know one another. Of course, there’s still the issue of Ghost being paid to keep Maddie hostage… but he’s much more concerned with keeping her safe, especially when it turns out the threat to Maddie might be much closer than they initially think. How can I articulate ALL my feelings about Maddie and Ghost?! I mean, with Maddie, at the beginning, I’m incredibly heart-broken for her. I can’t imagine what it’s like to wake up in the morning not knowing if this is the day your mom will drink herself to death. She’s profoundly alone: “Sister to no one. Friend to no one. Confidante to no one.” But truly, Maddie doesn’t have many other options but to care for her mother, go to school, and then repeat it the next day. To see her live this life with no hope just hurts. And what’s more heart-breaking is that Maddie’s sense of self-worth has taken a hit. When Ghost kidnaps her, she can’t imagine someone would have paid that much attention to her. But it’s in this situation that Maddie learns that she wants to live…and Ghost certainly helps her along the way. Remember how earlier I mention loving the fantasy of this story? Well, it’s only in fantasy that I could suspend my disbelief and swoon as Maddie falls in love with her kidnapper. I’m so glad Brighton gives us Ghost-POV because being in his mind gives us so much insight. From the beginning we trust him and we see that he and Maddie are quite similar. Both deal with loneliness and pain…both are trapped by a life that emerged from circumstances out of their control…both are searching for an escape. But what I love most about Ghost is the way he helps Maddie open her eyes to her true self…a beautiful, intelligent woman worthy of much more than her parents have given her. Here lies the obstacle. Ghost knows something more…some secret about who wants Maddie to be held hostage and why. He also knows that once she learns the truth, there won’t be much hope for forgiveness. But that doesn’t stop Ghost from putting Maddie first and striving to protect her, even if it means protecting her from himself. I won’t reveal any spoilers, but there is quite a twist at the end that completely illustrates Maddie’s initial despondency about her life’s circumstances and does (unfortunately) drive a wedge between her and Ghost. While there is an HEA (you know I can’t read a romance without one), the path Brighton takes to get us there is vivid, emotional, and compelling. Truly, sometimes the most courageous thing someone can do is to stop and walk away. I love watching Maddie embrace her agency, make choices that are best for her, and seek the help she needs. BRAVA BRIGHTON! I definitely recommend Captive for those who enjoy contemporary romance, new adult, and misunderstood bad boys ready to do what it takes to help the good girl they love. The novel is now available in bookstores and retailers, so add Captive to your Goodreads TBR list and buy your copy today. 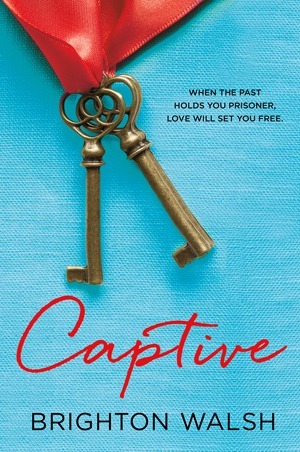 Thanks to Brighton and St. Martin’s Griffin we also have a paperback copy of Captive to give away! Enter using the Rafflecopter instructions below (U.S. and Canada only). Many thanks to both author and publisher for the opportunity to read and review an advanced copy.